For most people Fly Fishing is a hobby, but, for a select few, it is a profession. Unfortunately, trying to get your first job in the fishing business is the most difficult step. The Fly Fishing Guide Market is a very competitive profession. It is almost impossible to get a job without a good connection or specialized training. Sweetwater Travel fly fishing guide school will provide you with the necessary experience to land that essential first fly fishing job. Sweetwater Travel fly fishing guide school instructors are experienced, international fishing guides that have worked with Sweetwater in our international destinations and will teach you everything from rowing western rivers, running rapids in jet boats to helping you guide your clients into big fish. We limit the size of our courses to insure quality instruction and interaction with our instructors. This gives you the utmost attention from our fly fishing guide school instructors and increases your chances of getting a job afterward. The GI Bill® can help you become a fly fishing guide. It's easy with minimal paperwork. Please contact us for details. The Sweetwater Fly Fishing Guide School limits class size, so spaces fill up very quickly. Tuition for 2018 is $2,700 For 2019 the cost is $2,800. We require a 50% deposit to confirm your spot. This includes all your food and lodging. All you need to show up with is your fishing gear and a Montana State fishing license. Final payment is due 30 days prior to the start of the course. Deposits and/or final payment will not be refunded unless a replacement is found. We accept checks, money orders or major credit card. It is truly an opportunity that should not be missed. Join us and let us help you land the job of your dreams. 7 NIGHTS, 6 1/2 DAYS OF TRAINING, MOSTLY ON THE WATER. WE GO TO THE RIVER EVERY DAY. Ready to get you Dream Job? Plan ahead and Call NOW! Limited availability. Sweetwater Travel will also help perfect your fly fishing techniques. Being a good fly fisherman is essential to being a guide. You must be able to demonstrate your abilities in order to instruct and explain techniques to your guests. The fly fishing school instructors will focus on your casting and presentation. It is not necessary that you be a fly fishing expert to come to this school. We will accept all levels of fly fishermen. The rivers of Montana have excellent trout fishing. We will practice and help you perfect all trout techniques. From a fly fishing guide's point of view, trout fishing is the most difficult and is a good foundation for guiding for other species. Fly tying: Whether you are a beginner or experienced fly tier you will learn to tie flies from our professional fly fishing school instructors. We will teach you to tie nymphs, dry flies and streamers for catching trout, salmon, steelhead, bass and anything that swims. Knot tying: This is an often over looked skill. Losing Mr. Big because the knot you tied failed will put you in the doghouse in no time. We'll teach you the knots you need to know and how to tie them quickly and confidently. Fly-casting: As a guide you are also an instructor. Many of your guests will need assistance with their casting. We'll show you the best methods to get your guest casting like a pro in no time. You'll learn the roll cast, reach cast, false cast and the double haul for gaining more distance. Fishing Skills: In addition to the above skills you will learn entomology, fly selection, where fish hold and why they hold there, how to fight and land fish and much more. Guiding skills: Guiding is more than helping people catch fish. Client interaction is very important. Our experienced instructors will show you how to deal with the many different situations that will occur during your days guiding. You'll need to be a part time priest, psychologist, guru and marriage counselor. There are many complex aspects of fly fish guiding which can only be learned through experience. 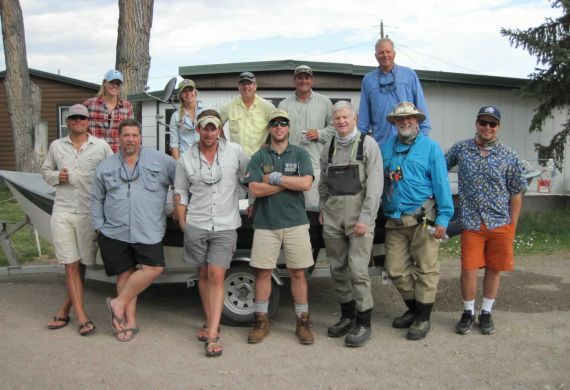 We will teach you: how to interact with clients, how to instruct fly fishing, what guests expect of you, and, of course, how to get them into fish. You will learn what knots to tie, how to net fish, guiding strategies, drift boat fishing, spotting fish, jet boating, motor maintenance, and advanced river reading. The school will also include CPR and First Aid certification, which is required by all guiding operations. Drift boats are the most common form of fly fish guiding in the lower 48. Jet Boats are the primary form of transportation used on Alaskan rivers. By learning both jet boating and drift boating skills, you will increase your chance at getting a job. The fly fishing guide schools are operated on the Big Horn River near Fort Smith, Montana and the Yellowstone River near Big Timber, Montana. Both are perfect rivers to train for both jet boating, and drift boat fishing. By learning how to run a boat on these rivers, you will gain the experience and confidence needed to be both a jet boat, and drift boat guide. During our fly fishing guide school instructions, we will focus on reading water, driving techniques, rowing, and on-river outboard motor repairs. We will also show you how to deal with common jet boat problems such as water in your gas, draining your carburetors, repairing broken pull cords, bad spark plugs, etc. Being able to both drive a jet boat and to fix most problems on the river is an invaluable experience as a guide. This is a skill that very few, if any, new guides have when they apply for Jobs. Low impact use: This component of the course highlights how to guide on public waters with a particular focus on minimizing impact to the public resource. This includes safely playing, photographing and releasing fish, campfire safety and etiquette, wildlife proofing gear and vehicles, the importance of following angling and boating regulations and an understanding of private property and guide/landowner interaction. Safety: Our safety portion of the course will include proper trailering techniques including strapping boats down, following safety checklists, proper stowage of spare oars, use of bear sprays, a discussion of wildlife interaction in remote locations, bear safety and basic swift water safety. We run twelve schools a year. Four schools in mid March/April, five in June/July, and three in September/October. Dates are listed below. Please contact us for availability. Upon arrival at the lodge, everything is covered (except your fishing license). This includes room and board, airport transfers(not flights) and everything needed for training. You will need to bring your own fishing equipment, waders, etc. You should arrive at the school Saturday afternoon/evening or Sunday morning. After unpacking and settling in, we will start training Sunday afternoon. Monday to Friday will be full days of training. Saturday, we will conduct exit interviews during the morning, and the school will end mid day. A typical day begins at 8:30 and we are off of the river at 6:30. Depending on the focus of that particular day, many hours will be spent on the river, to practice our fishing and guiding techniques. Evenings are spent tying flies, practicing knots, watching fishing videos and swapping lies. The course will consist of six and one-half days of thorough training at the cost of $2,800 per person. Last year’s students had a very high job placement with lodges in Alaska and many states in the lower 48 including Montana, Colorado and Wyoming. The average pay including tips was $2,400/month. Each day spent on the river drift and jet boat training will include client interaction and honing your fishing skills. We will also help you build a resume and get it to the lodges and outfitters who hire our graduates each year. I just wanted to send an email thanking you for how much of a blast I had while at guide school! The whole experience was amazing. The instructors were extremely nice, informative and most importantley fun. I learned more in a week than I could have in years. The jet boating and the guides manual that was handed out will surely come in handy when I am up in Alaska. Speaking of which, I want to thank you for that as well. Without your help, I would have never got the job I have now in Alaska. I leave on the 7th and I must say I am incredibly excited. Overall the experience of guide school was great, well worth it and has provided me with amazing new friends. Again, thanks for being so awesome and helpful through the whole process! I want to give you an update on my season here in Italy. I had my first guests of the year for a total of 5 trips and so far it has been exceptional! I have had nothing but great response from the guests. They appreciated the quality of service and the fishing. I cannot thank you enough, two guest re-booked trips and I feel so much more confident with everything I learned at Guide School. Your course has changed everything for me and coming to guide school really paid off! You guys are awesome! Thanks for the amazing week! I will recommend the Sweetwater Guide Training course to all of my friends. Even if they don't want to become guides it's the best way to learn rowing, knots, fly tying and best of all... how to catch more trout! The instructors are all world class and very patient. I'm excited to get started with my first job that you helped me land. I'll do Sweetwater proud! I wanted to let you know how impressed and happy I was with the guide school. While I went in as one of the "greener" students it was perfect for finding a good place to start what I hope to be a long career. Every single instructor did a phenomenal job. Not just the wealth of information each of those guys have but their passion for Sweetwater and growing the sport is infectious. I was so excited to get out and learn more from those guys. Thank you for everything and it was a pleasure to get to know all of you. I look forward to getting more hours on the river and staying in touch to let you guys. I'll let you know about my progress and hopefully be able to get into my first year of guiding when I am ready. Thanks again for the great week. I want to take a minute to thank you, your guys and gal and everyone involved with the class for an amazing experience. I fancied myself a pretty accomplished fly angler and didn't know how much I would actually get from the class. I was looking at it as more of a networking opportunity and I couldn't have been more wrong. Not only did I learn a ton but was completely blown away by the professionalism and friendliness of you and your staff. The class was dialed, seamless and most of all fun! I would highly recommend it to anyone wanting to become a guide, anyone wanting to become a better angler and boatman and just looking for a ridiculously fun week! I couldn't have been more impressed and could have paid double and still felt it was well worth the money. I can't wait to start the season guiding in Alaska and feel hugely confident that I am now armed to get started on an amazing new career path. Thanks again for everything. You guys rule! I just want to give you an update on how my guiding has been going up here in Alaska. I've been having a stellar year so far, getting clients on a ton of awesome fish while having an amazing time! Thank you so much for being a reference for me, your support has helped me tremendously. The guide school definitely gave me a good head start and prepared me for the challenges of guiding in Alaska. I was guiding solo within the first week with extreme confidence. Thanks again for everything. I'm having the time of my life! I'm writing to express my gratitude for the hard work you all put in during the week to help make me a more accomplished angler. I came to the class not wanting a job as a fishing guide, rather to enhance my fishing and boating skills so I can catch more fish and row a drift boat safely and with confidence. Your class exceeded my expectations. My friends and I are catching more fish and I'm no longer putting the fear of god in my buddies while I'm rowing! Kudos! My week at Sweetwater Fly Fishing Guide School was one of the most rewarding experiences of my life. Ron and the highly experienced staff provided our group with all the fundamental skills we need to become proficient guides at any lodge or outfitter across the country. The school is structured in such a way that the participants, whether they have literally no experience or are already active guides, will walk away as exponentially better fishermen. The staff is incredibly knowledgeable about fly fishing, boating, and the guiding industry as a whole. Even if you may be unsure if guiding is in your future, the Sweetwater School is a perfect escape and a chance to try something totally new while enjoying the beautiful Montana wilderness. It's a memory that will stay with me for the rest of my life. I just wanted to keep you posted on how the job search is going. The past 24 hours have been a whirlwind! I have been contacted by 5 lodges that I recently applied to and I'm certain that I will land a job soon. Thank you for all of the help you have provided and truthfully I would still be chasing my tail wondering where to begin if it weren't for the Sweetwater Guide School. My next email will say which fantastic lodge I will be working at this summer. I hope to further advance the excellent reputation Sweetwater has for producing fantastic fishing guides! Thank you for an amazing week and experience. The guide school strengthened my passion for fly fishing and enhanced my skills and interest in guiding. It was the best week of my life! I just got down to the ranch on Saturday. I guided the first morning out, and then ended up shadowing most of the week until Thursday. The first fish I put my guest on was a 15 inch brownie, and we landed 5 more after that. I took out some kids and put one of them on a 19 inch rainbow. The guide school made me more than ready for the job on the ranch. Hats off to The Sweetwater Guide School! I’m reaching out to you today to let you know I’ve been hired to work in Alaska this summer. I wanted to extend a big thank you! My experience with The Sweetwater Guide School was a huge help in this process. So, thank you! After taking the Sweetwater Guide school course never would I have thought that I'd be gearing up to be guiding in Alaska for it wasn’t my initial intuition. Alaska has surfaced over the years as an idea but I never knew how to go about it. As a teacher and coach, being a guide has been in my minds eye as a great summer gig, thanks to you guys its become a reality. I’m looking forward to my first season up in Alaska and will keep you posted on my progress. Cheers! I really appreciate the class I attended and all of your Steve and Callan's efforts. I really feel as if I made some great new friends and learned a ton . You all did a amazing job teaching and helping . I absorbed a lot from the class and use it daily when teaching the students I have here at Orvis. I cannot express what a great time I had and do not hesitate when someone asks about the class of expressing how amazing it was. Thanks again for everything! Hope all is well. I was in your first group last March on the Bighorn for the guide school, in case you can't remember. I had an amazing summer guiding on the Grand Cascapedia. I was kind of rushed into the guiding position as they were missing one guide. After 2-3 week training, learning water I had never fished & using a 26' cedar canoe, they finally sent me on my own with 2 guests every day. What a great experience! I learned so much and still have a bunch to learn. Fishing was tough but we still managed to do very well. Tried to keep the guests on fish & happy. The lodge had great comments from the guests about me and they are hoping for me to work there again next summer, which I will. I am really glad that I attended your class. I believe you guys prepared me well to become a good guide. Thank you!